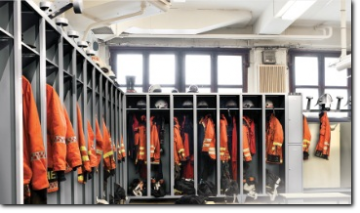 The lockers for firemen are designed for saving seconds needed by preparing for a rescue operation. In our assortment you can find basic types of lockers. According to your needs we can design and prepare a special locker suitable to your special demands. 2170 x 400 x 500 mm, Stable steel construction on feet h = 120 mm, with perforated bottom, helmet holders, hook for belt in each compartment, RAL 3000. 2170 x 400 x 500 mm, Stable steel construction on feet h = 120 mm, with perforated bottom, helmet holders, hook for belt in each compartment. 2170 x 800 x 500 mm, Stable steel construction on feet h = 120 mm, with perforated bottom, helmet holders, hook for belt in each compartment, RAL 3000. 2170 x 800 x 500 mm, Stable steel construction on feet h = 120 mm, with perforated bottom, helmet holders, hook for belt in each compartment. 2170 x 1200 x 500 mm, Stable steel construction on feet h = 120 mm, with perforated bottom, helmet holders, hook for belt in each compartment, RAL 3000. 2170 x 1200 x 500 mm, Stable steel construction on feet h = 120 mm, with perforated bottom, helmet holders, hook for belt in each compartment.